When times are hard may hardness never turn your heart to stone. May you always remember when the shadows fall you do not walk alone. May God bless your family as they grieve for you! You were obviously a very happy person! Your service to our country is honorable and under appreciated. Americans are safer because of your sacrifice. Even though I didn’t know you, you are my hero. Semper Fi Brother! We have the Watch. Rest In Peace. “Some people wonder all their lives if they’ve made a difference, Marines don’t have that problem. “ -President Ronald Reagan. Brother, your smile was always contagious, weather it was a hot 120 degree day in Iraq, or a frigid day on the streets in Milwaukee. You made a difference with the brothers and sisters your served with in Milwaukee. You made a difference with everyone you served with in the Marines. You made a difference in a war-torn, dusty, hot country full of people you had never met. You made a difference on the streets of Milwaukee. You are my brother and will never be forgotten. Until Valhalla. RIP my Marine and law enforcement brother. My prayers are with your family friends. Thank you for your service Marine. May you rest in peace. Semper Fi! Thank you for protecting and serving this city. You will always be remembered as a hero. RIP Officer Rittner. Praying for your family. Rest easy Brother. Prayers for family, friends and coworkers. RIP Officer Rittner. Sincere condolences to his family and loved ones. May God give them strength through this sad time. You were a hero and were taken too soon. Salute and Respect. Your Service is appreciated! May your family and Department stay strong at this time. 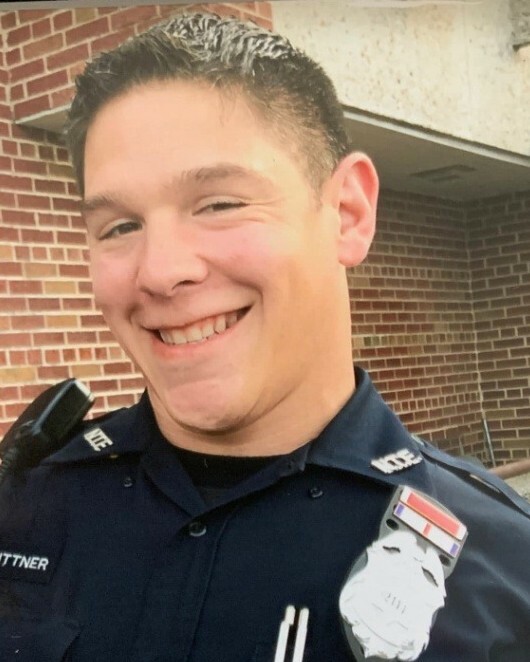 The thoughts, hearts and prayers of everyone here at CCPD go out to the families, both blood and blue, of Officer Rittner. May the Good Lord give you strength, comfort and peace. I am very sorry to learn of the passing of a brother and hero in Police Officer Matthew Rittner. I know our Heavenly Father has welcomed him home into his loving arms where he will now patrol the golden streets of Heaven. May the Lord deliver blessings, comfort and peace to his family, friends and all members of Milwaukee Police Department. Eternal rest for you, my brother. May Officer Rittner gain immediate entry into God's Kingdom. Prayers have been sent for Officer Rittner, his family and to the Milwaukee Police Department. Godspeed my Brother! On behalf of POINT 27, we would like to offer condolences for Officer Matthew Rittner. Please know we are eternally grateful for Matthew’s service and his ultimate sacrifice. To honor Officer Rittner, POINT 27 sent 27 Thin Blue Line Dog Tag Necklaces, engraved with “Blessed are the Peacemakers for they will be called children of God” Matthew 5:9, to the Milwaukee Police Department for Matthew’s partner and fellow officers. POINT 27 sent a Folded Flag Necklace engraved with “Greater Love has no one than this; than to lay down one’s life for one’s friend” John 15:13 for Officer Rittner’s wife.